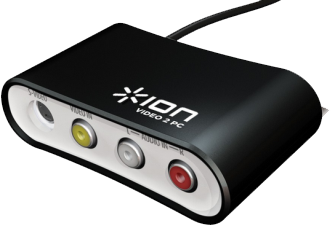 This video and article walks through the initial setup and installation of the ION Video 2 PC MKII on your Windows-based PC. If you received a disc with your Video 2 PC MKII, follow these steps to install the drivers and software. Windows 8 users please note: If your computer uses the Windows 8 operating system you will need an update to Cyberlink Power Director 9. The software included on the disc will not function. Please request an authorization code from www.ionaudio.com/support and follow the steps below for the Driver and Software Download Installation. Insert the CD into your computer's CD drive. In the window that appears click driver under install. The driver and software links are separate and must be installed individually. If this window does not automatically appear, double-click my computer then double-click the CD. The window should now appear. Follow the prompts on screen to install the driver. You will now be prompted to restart your computer. Choose Yes, I want to restart my computer and then press Finish. Once your computer has restarted, go back to the main screen of the Video 2 PC MKII installation disc. If this window does not automatically appear, remove the installation disc from your computer and reinsert it. Follow the steps and click Yes, Next or OK when prompted. Fill in your User Name and press Next. See Software Setup to configure your Video 2 PC MKII with Cyberlink Power Director. By default, your computer may save items to your Downloads folder. If you are prompted to choose a location, we recommend selecting your Desktop. Locate the files in your Downloads folder or on your Desktop and unzip them. If you are unfamiliar with how to unzip a file please see this video. You will now see two versions of the downloaded files. Two zipped folders and two unzipped file folders. Open up the unzipped file folder labeled video_2_pc_mk2_setup.exe and double click on the file labeled video_2_pc_mk2_setup to begin driver installation. You may receive a warning regarding the security of the driver. Please click Run to advance. You will now be prompted to restart your computer. Choose Yes, I want to restart my computer now and then press Finish. Once your computer has restarted, locate the unzipped folder titled Windows_8_Software from the original download location you chose in step 2. Open this folder. Then open the folder titled PDR9_DE_TR130313-029. Locate the file titled setup and double-click to open. You will know which setup file to click if you look to the right and see Application in the third column. Click Run to begin the installation of Cyberlink Power Director 9. Upon opening Cyberlink Power Director for the first time you will be prompted to enter your software serial code. The Activation Key serial code can be found on the back of the CD sleeve. Type in your code and hit Next. Note: If you have installed your program from a disc, your authorization code will be located on the back of the CD sleeve. If you are installing from a download link Please request a new authorization code from www.ionaudio.com/support if you haven't already. You can choose to register or press Skip Registration to proceed. In the top right of the Cyberlink Power Director program click then click . Note: the TV signal will be the only input you use when capturing from the Video 2 PC MKII. Go to in the lower right hand corner. Under Capture Source, select VideoComposite or SVideo depending on your connection. Select Line (ION Audio USB 2861 Device) in the Audio device drop-down menu. Click OK to close the window. You are now ready to begin converting. Start the device you have connected to the Video 2 PC MKII and you should see video in the preview window. Whether you are a customer or dealer, if you already own an ION product, or if you just have pre-sales questions, our experienced technical support team is here to help!